This entry was posted in language, linguistics, Literature and tagged advertising, branding, creativity, language, literature. Bookmark the permalink. I’m a little annoyed with it, being less than pleased with the series, as the title is a beautiful metaphor for the Seattle area, but nothing else about the story is. Reblogged this on la sal de la vida. Fifty Shades of Putin is my favorite. Most recently, I saw a tea shop advertising ’50 Shades of Earl Grey’. Recently, the much talked about movie ‘Fifty Shades of Grey’ has hit the Big Screen everywhere. 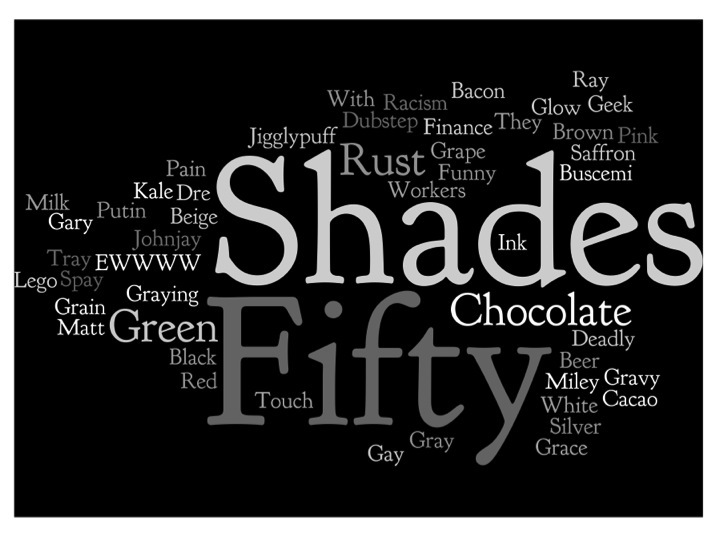 So, a fellow blogger decided to share the different ‘fifty shades’ with us. Take a look. Do not forget to share your thoughts, a series or movie you think we should all see. Reblogged this on A Dream Within A Coffee.